You’re going where? For how long? 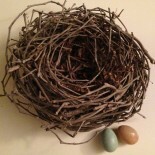 | A COMPLETE, Empty Nest. I might have mentioned that I was never the mom that couldn’t wait for the kids to move out. When my son briefly moved back in after college and brought a bonus friend with him, I was thrilled. When on occasion my daughter decides to spend a few days or weeks in her old room, I’m giddy. If they wanted to permanently move in with daughter in law and three grandchildren included, well, I’d think I’d died and gone to heaven. So imagine how opposite of giddy or thrilled I was last year when my daughter left to study abroad in Japan for 4.5 months! I am not at all embarrassed to say that when she walked through the “no visitors beyond this gate” exit and I could no longer see her, I sat down on a bench and cried. Big old crocodile tears. Japan is so very far away……. We kept in close touch. She had a truly wonderful experience, and she was safer than I could have ever hoped, but she was IN JAPAN. She was fiercely and stubbornly independent and managed to find her way through Tokyo all alone, through a multitude of different prefectures, festivals, rural areas, restaurants, language barriers, and new experience after new experience. She had a great roommate, she turned 21 while there, made some good friends, got to see Studio Ghibli, and overall had the best study abroad experience she could have hoped for. Yes there were some struggles, and she would check in with me to ask for advice or get feedback on how to handle things. She had a few illnesses that threw her off track, and a very unfortunate situation with a friend who had some serious health issues, requiring my daughter to make some very scary adult decisions. But she survived, I survived, and she came home in one piece. Upon her return I smugly and over confidently thought, “Well thank God THAT’S over with.” Wrong. In what world did I ever think her traveling was over? Literally ONE WEEK after her return, she informed me she was most likely going back. “Excuse me??? “I stammered my way though a shocked, “But you just got back…….” I should not have been surprised. She had been bitten. She had her taste. She wanted more. And when I say ‘more’, I mean-She wanted to go back and teach English through the JET program for a minimum of one year, and most likely more. Wow. How did she slip through my fingers as quickly as she was back in my grasp? Color me absolutely shocked. So since August of last year, I have been mentally preparing myself for her exit again. To call this a challenge would be an understatement. I have had to monitor my mouth so as not to make too many “Please don’t go” comments. Well okay, I haven’t actually said that, but I sure have thought it 1000 times, and my daughter would probably say she’s given me the warning look more times than she would like. Quite honestly, I have had to spend considerable time keeping my thoughts to myself, and I have bitten my tongue often enough to feel the pain. But I’m proud to say I’ve graduated to making encouraging comments about her time away, which is a big accomplishment! Of course I want her to be independent, travel the world, be in her beloved Japan, and feel the satisfaction of teaching others. I just get nervous that she will be too far away from me if she needs help. And of course I will miss her company. When I would be irritated with my own mother for worrying about me as an adult, she used to say to me, “I will always be your mother no matter how old you are.” I guess I get that now. I raised my daughter to be fiercely independent and be equipped to handle most any situation, and damned if she hasn’t become just that person. My angst won’t ever go away when it comes to my kids, but I have to step back and believe I raised some very incredible adults. So I will get through this. She will flourish in 1000 different ways. Thank God for FaceTime and texts, and maybe even the possibility of a trip to Japan for me. This entry was posted on February 16, 2017 by renetmyers and tagged adulting, independence, Japan, letting go, mother daughter relationships, parenting, parenting adults, separation, teaching, travel.